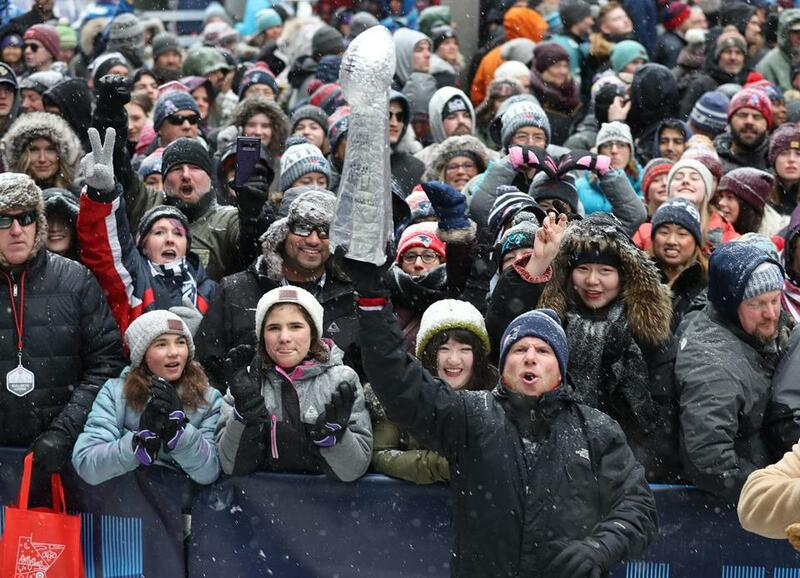 Patriots fans were in the spirit Saturday during a pre-Super Bowl rally in downtown Minneapolis. IN 2016, THREE Dartmouth professors published a paper on, of all things, Deflategate. After surveying nearly 3,000 people (and carefully sifting their answers), the political science professors found that Patriots supporters were more likely than other fan bases to believe unproven conspiracy theories — such as one that held the NFL was punishing New England to distract from its other public-relations problems, including player concussions and domestic abuse. That wasn’t all that surprising. But this was: The more Patriots fans knew about football, the more likely they were to buy into the conspiracies. More information, in other words, did not lead to better beliefs. A rational and informed sports fan seems about as plausible as a warm and fuzzy Bill Belichick. The most surprising revelation, of course, may be that academics are diligently analyzing sports fans. But in a new book, “Superfans: Into the Heart of Obsessive Sports Fandom,” George Dohrmann shows there’s a lot to learn about our rooting interests. Dohrmann, who has won a Pulitzer Prize for his sports writing, profiles a number of passionate fans, including a boy whose Tom Brady rant (“I hate him!”) went viral. But Dohrmann also shares insights from academia on how we become fans and why we care so much. And the biggest lesson, whether you root for the Patriots or someone else, is just how powerful fan identity can be. They’re underpaid, exploited, and objectified, in a game with a lousy history of violence against women. Ideas reached Dohrmann at his home in Ashland, Ore.
Below is an edited excerpt. The study of fandom really took off after a professor named Dan Wann created the Sports Spectator Identification Scale in the late 1980s. Why? The SSIS was a breakthrough. It’s just a series of questions — questions like, how often do you wear the gear of your favorite team? — but no one had ever tried to measure fandom as a scientific question. Suddenly you could compare fans with a high identification with their team to fans with a low identification. You could put a number on it, and all sorts of later studies now begin with that scale. A grad student, for instance, is studying the impact fandom has on smell. She’s spraying deer urine on a University of Kentucky sweatshirt and then studying whether the shirt smells better or worse to you if that’s your favorite team. A professor at Belmont has studied Green Bay Packers fans to see if the most passionate ones are happier during the season or during the offseason. Why is it so important to look at these questions through the lens of identity? Identity includes all kinds of things like your family, your political views, your profession, maybe your religious beliefs. Some people are willing to say, “My job and my love of the Patriots are both equal parts of me.” For a lot of people, that’s not a comfortable thing to admit. But it’s crazy the way fandom impacts us. There was a study at Indiana University where they showed male students a picture of a beautiful woman and asked them, do you think you have a chance to date this woman? After a loss by the university’s basketball team, far fewer students thought they had a chance. But after a win, far more did. The team’s winning shaped their self-esteem. If your favorite team loses and you’re devastated — that is not something outside of you. That is a part of you. This all sounds very New England. It’s amazing how much Tom Brady comes up when you talk to these professors. They often see fans create reasons for why a dynasty has been successful. This is why people outside of New England obsess over Deflategate or Spygate. If you’re a Steelers fan, it’s very difficult to just say, yes, Brady is great, Belichick is great, and they just do it better than my team. So these fans create things to protect their team and their identity, including Deflategate and Spygate. If the Patriots win because they’re cheating, that’s not as much as blow to my self-esteem as the alternative. You said that fans sometimes resist this idea of identity. Does anyone ever accept it? I write about one guy who was a massive Vikings fan. He ran a huge message board for other Vikings fans. He would have scored off charts on SSIS. Anyway, after the stories about Adrian Peterson beating his child came out, this guy decided he couldn’t do it anymore — that it sickened him to watch football, and to watch fans making excuses for Peterson. When we talked, it dawned on him that one of the reasons he was able to step away from football was that he became a father. So he swapped out a big part of his identity, Vikings fan, and moved in a new part: father. Craig Fehrman is a freelance writer.